UPDATE: Vivadi Family creates a four-room AV network for £2999 | What Hi-Fi? We first saw this Vivadi system at the CEDIA Show in London in June, and now comes confirmation that it will be on sale in the UK from September. Three systems will be available: the 'Family' system for £2999, 'Luxury' system for £3999 and 'Premier' system for £8999. They've been designed to meet a range of specifications and budgets, but each will convey Full HD (1080p) pictures, 7.1 channel HD surround sound and deliver on-screen control all over the home. Simple, easy-to-install multiroom systems are all the rage here at CEDIA 2011, and the Vivadi Family set-up shown above is designed to create a four-room audio and video network for £2999. At its heart is the MM322 MediaMaster which handles Blu-ray, DVD, CD, MP3, recorded TV, radio, photos and videos. It's suitable for driving a 1080p Full HD screen or projector, and a multichannel amp or receiver. A 2TB hard drive is built in, along with twin Freeview HD tuners with 14-day EPG, and there's full internet access for web TV, YouTube, Facebook and other social media sites. The Smart H1 client units will stream all the music and video content from the MM322 to other rooms in the home. The H1 can handle Full HD video with Dolby Digital and DTS 7.1 surround sound. The client unit can also be fitted with a hard disk, enabling users to double the system's capacity to 4TB. This can be further increased by adding a USB hard disk drive and/or a Network Attached Storage (NAS) device. 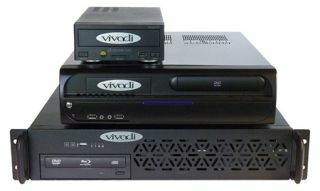 As an alternative to the Smart H1 units, users can choose the more compact Vivadi Lite client (top right in the picture) which is smaller, but won't stream Blu-ray material. Upgrading from a Lite to a Smart H1 costs £20 per room. A TCP/IP interface allows the system to be controlled using Crestron, AMX, Control 4, Pronto and Opus devices, or via an iPhone/iPad app. All client units are connected to the MM322 MediaMaster using a standard Ethernet network with CAT 5 or CAT 6 cabling.